The Moon Landing: Urban Legend? Versions of the Moon Landing Conspiracy Theory have been around since the initial lunar landing. Most theories revolve around various ideas about how the Apollo program and the moon landing that was its goal were faked. The various reasons for the hoaxes included a desire to beat the Russians in the Space Race, provide a success for NASA or to distract the public’s attention from the war in Vietnam. A Gallup poll in 1999 revealed that 6% of the population believed that the manned landings were faked. A later poll by Dittmar in 2005 indicated that 25% of the twenty-somethings doubt the moon landings. 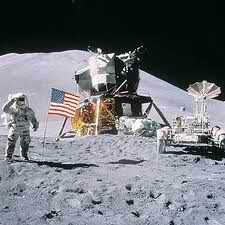 The facts are what they are: A dozen astronauts walked on the Moon between 1969 and 1972. They returned with 800+ pounds of rock from the moon that contain tiny craters from meteoroid impacts and isotopes from cosmic radiation that would have been blocked by the Earth’s atmosphere. (Check out “Big Muley,” at 11.7 kg the largest Moon rock returned to Earth by Apollo astronauts.) In conclusion, unless there is PROOF to the contrary, the Apollo astronauts landed on the Moon, explored the surface, and left plaques and instruments when they returned to Earth.